For Northeasterners, the drive between New York and Boston is notoriously boring. There are very few attractions along the stretch worthy of a pit-stop, and and the only source of entertainment is wondering why it takes so long to drive through Connecticut. For Northeasterners, the drive between New York and Boston is notoriously boring. There are very few attractions along the stretch worthy of a pit-stop, and and the only source of entertainment is wondering why it takes so long to drive through Connecticut. In order to compensate, drivers rush and settle for quick-fixes at fast food chains or diners advertised on the highway. But, unknown to most, there is a secret oasis along I-95 where award-winning restaurants and a lively food city are waiting to astound you. You won't see much as you first approach Providence, but take a look behind the large mall towering over the highway to find the intricate dome of the State Capital peeking out of the skyline. This is the first glimpse into Providence's well-kept secrets that even the most well-traveled Northeasterners haven't discovered. The city of Providence was established in 1636 as a religious safe haven, where people of all religions were welcome to practice. Freedom of thought brought an economic boom to the city and it grew into a bustling seaport and a cultural hub for artists. You can visit the well-preserved remnants of Providence's great history just by walking the Independence Trail, which passes landmarks like City Hall and the RISD Museum. Or, to get a literal taste of Providence's history, head across the river to Federal Hill. On the Savoring Federal Hill food tour, you'll learn more about the history of this community established by Italian immigrants. Starting in Depasquale Square, taste test cold cuts from typical Italian grocery stores, get a behind the scenes look at Scialo Bros. Bakery, and check out the wine selection at Gasbarro's—the first wine shop in the United States to ever import wine from Italy. The award-winning tour led by Chef Cindy Salvato is the perfect introduction to the city's Italian heritage, and a great place to begin your exploration of Providence's food scene. And if the tour's not Italian enough for you, check out La Gondola for a romantic ride through the city on an authentic Venetian gondola. If it's 2 a.m. and you're craving James Beard award-winning comfort food, Providence is the place to be. Olneyville New York System is an eat-in or take out joint that won the James Beard Award for the "American Classic" category in 2014, and it's been a long-time local favorite run by the same family since the 1930's. The signature combo is hot wieners (don't let them catch you calling them hot dogs) and a side of coffee milk, flavored milk unique to Rhode Island. The preserved 1950's decor and hot wiener topped with onions and meat sauce might trick you into thinking you're in for a heavy and greasy meal, but the delectableness of the hot wieners is instantaneous and the coffee milk is the perfect drink to wash it down. It's no wonder you'll find half the city lined up outside the door on a lively Friday night—locals, tourists, and even award-winning chefs from some of the most popular restaurants in the city. If your trip of Providence is right around the corner, you better start working up an appetite now. With an overwhelming multitude of delicious and renowned restaurants to choose from, trying each and every one is next to impossible depending on how long your trip is. Throw a stone and you're bound to hit something delicious. Here are some of my favorites to guide you on your culinary exploration. As you explore the city, you'll receive more restaurant recommendations than you'll know what to do with. 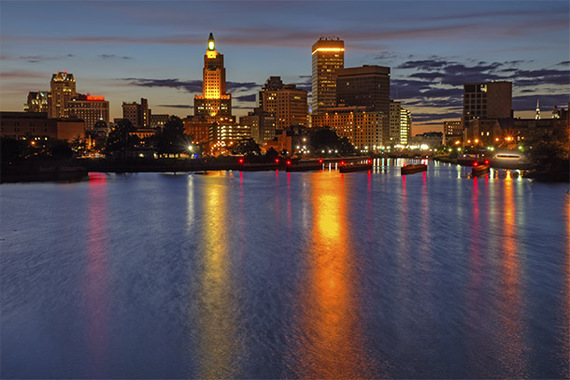 There is a lot to see and taste in this small capital, but as long as you leave with a full stomach and an Instagram feed full of artfully-plated dishes, you've done Providence right. What food discoveries have you made in Providence? Share in the comments below! Read the original story: Why the Next Big Food City Could Be Right Under Your Nose by Jamie Ditaranto, who is a regular contributor to SmarterTravel.